OAKLAND — How do you explain suffering your biggest defeat against the Western Conference’s second-worst team? How, after allowing about 99 points per game in the last five, do you give up 126 points to the 21st-ranked scoring team in the NBA? Is there an explanation for shooting 13 percent from three-point range? 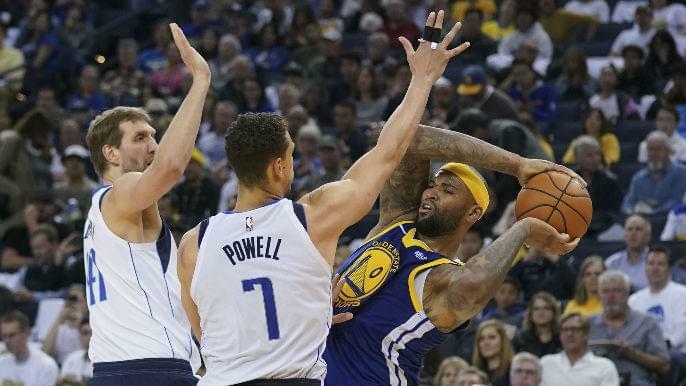 There wasn’t much explanation, or willingness to explain, after the Mavericks drubbed the Warriors, 126-91, Saturday night. The Warriors players and coaches let out a bunch of “I don’t knows” to a variety of questions, regarding the abnormally bad defense, the terrible shooting, and the team’s random tendency to lose big at home. When asked about the loss, Klay Thompson identified the poor shooting, which isn’t surprising. With Stephen Curry resting, the Warriors got pummeled in just about every facet of the game, aside from fast break points. The Mavericks went 21-49 from three-point range. The Warriors went 4-30. The Mavericks tallied 33 assists to Golden State’s 22. The Mavericks outscored the Warriors, 108-70, through the opening three quarters. The loudest cheers of the night were elicited from Luka Doncic’s step-back threes and each of Dirk Nowitzki’s season-high eight field goal makes. Some of this had to do with Curry’s absence. He changes everything — whether spacing or game flow — even if he doesn’t score. Maybe it was just a bad shooting night. Or maybe, with the playoffs looming three weeks away, and the Warriors in the midst of a three-game home stand featuring non-competitors, these letdowns just happen. The Warriors have not been shy about the challenges of trudging through the regular season before ramping up the energy in the playoffs. Even if the numbers don’t add up, this loss was somewhat understandable. Last week, the Warriors won three of their four road games over the Rockets, Thunder, and Timberwolves. On Thursday, in the team’s first game of its three-game home stand, the Warriors stymied the Pacers to 89 points, the second-fewest a Golden State opponent has scored all season. Warriors players and coaches praised the defensive intensity. Riding that high, against a bad team, on the front end of a weekend back-to-back, was probably not a realistic expectation. But it was also hard to anticipate these Warriors, even without Curry, to suffer their largest defeat of the season to the Mavericks in Oracle. The Warriors won’t have to wait long to respond. They welcome the Detroit Pistons to Oakland Sunday evening. The Warriors will travel to Memphis, then Minnesota, before returning next Sunday. “The only thing we can do at this point is move forward and bounce back tomorrow,” Thompson said.